Andrew Rubin founded Terrace Electric LLC in 1995. Andrew is a life-long electrician starting at age 16 when he entered vocational trade school. His 5-year electrician apprenticeship introduced him not only to the world of the electrician’s trade but also allowed him to fully “conceptualize the magical properties of this invisible force”. Two minutes spent with Andrew today will show you he’s lost none of his enthusiasm and love of his chosen profession. He enjoys nothing more than a physically and mentally challenging electric troubleshooting project that he can make correct. The company tag line says it all; “The Difference is Excellence”. I awake with excitement knowing that I will be working with and controlling a power that makes us warm, gives us light, and makes motors spin. The importantance of your refrigeration, heating, power, and comfort is why being fastidious, meticulous, methodical are some of the attributes that set us apart from the mediocrity of other contractors. An electrical system needs to work for you reliably well into the future. Building these systems makes me happy, because I know that I’m helping you well after the project is complete. Not only do we creating a robust electrical system, but we leave your home or business cleaner than we found it. This attention to detail, taking pride in our workmanship, and performance is our difference. Terrace Electric LLC is located in Youngsville NC, and services residential and commercial clients all over the greater Raleigh metropolitan area. His distinctive trailer truck can be seen at residential and commercial projects all over North Carolina. Terrace Electric is licensed and has a valid business permit for the state of North Carolina. We’re fully insured and bonded and will provide certificates of insurance upon request. 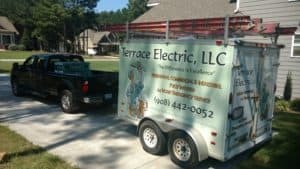 Terrace Electric is the only electrical contractor that you will find that supplies a 1 year warranty on materials and 10 years on labor. Read more about our warranty here including limitations. We’d be nothing without our great customers. Please read some of our customer testimonials here. Serving the Youngsville, Wake Forest & Raleigh, NC areas.